For former Bassmaster Elite Series competitor Ben Matsubu, who lives in Hemphill, Tex., there is no better time of the year to fish than the prespawn. Matsubu, who lives and guides on Toledo Bend Reservoir; East Texas’ famed bass fishing Mecca; the prespawn means opportunity. Matsubu was no slouch on the national tours; in a decade competing on the Bassmaster Tournament Trails, the 47-year-old earned $430,000, two wins; one in the 2006 Elite Series Wildcard Qualifier on the Harris Chain, and an Elite Series win in the final event of the 2007 season on the Kissimmee Chain. His career to date includes a trip to the 2004 Bassmaster Classic and ten top 10 finishes. For now, Matsubu is content to spend his days on the reservoir that he has called his home for several years, and his days are spent fishing, guiding clients and winning team tournaments. He is quick to point out that much of his understanding of the reservoir came from bass fishing legend Tommy Martin, but he spends as much time as he can on the water refining what he has learned, and experience more for himself. 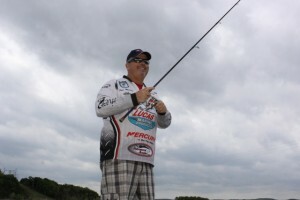 He plans to turn the practice time into a run at the Bassmaster Central Opens in 2012, and he spends as much time as he can on the water honing his craft. So, what does Matsubu think about during the springtime? It’s all about transitions; for the fish, and where he can find them. He also likes to keep in mind that conditions change quickly, and quick changes in the weather can often mean quick moves from big female bas; specially this time of year. With this in mind, the final consideration for his fishing areas is to find one that has a sloping transition next to it. “I’ve found that this lake is different than the Western Lakes I started fishing on,” he said. “They need to have a long, sloping transition into deeper water. If it’s a steep drop off, the best fish don’t really use them.” He also said that it’s helpful if there is a laydown on that ridge. For Matsubu, the prespawn through postspawn period is all about five lures. When the fish first show up around the ridges, he throws a ½-ounge Talon Lures Custom Weedless Football Jig in some sort of brown an purple color; either cinnamon purple, PB&J or Oxblood II; he adds a five-inch Yamamoto Twin Tail Trailer in 221 (cinnamon purple) color. His final lure is a Yamamoto Senko in color 912 (watermelon / green pumpkin laminate); which he uses for cruising bass and for catching spawning fish that have become agitated with the swimbait.